The IA Design team designed a multi-functional head office for GPC Asia Pacific, successfully housing the office and warehouse staff of two GPC brands (Repco and Ashdown Ingram). 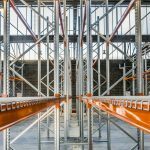 The project involved creating a dynamic dual-purpose environment that met the needs of over 130 office and warehouse staff. A core objective of the project was to increase employee collaboration amongst brands and business units. To address this, a series of indoor and outdoor breakout spaces were incorporated to effectively bridge the connection between the office and warehouse teams. The IA Design team were responsible for the architectural design, working closely with service engineers and external specialists to ensure all works were certified per the requirements of the Brisbane Airport Corporation. The new head office was designed with optimal flexibility in mind, taking into account the potential for future growth. The final result was a dynamic workplace delivered on-time, within budget and exceeding brief expectations.